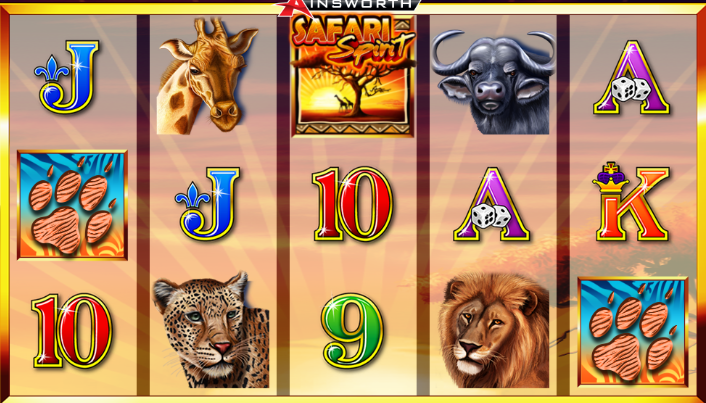 After being a popular title in the land based casinos, Ainsworth Games Technology released the online version of Safari Spirit slot machine in May 2013. Even though there few features that have been left out from the original version, you will still love the many ways to win it offers. Ainsworth gives you a chance to head to the African Savannah plains where wild animals roam freely in their Safari Spirit slot game. You will see different wild beasts including an elephant, a rhino, giraffe, cheetah, buffalo and Lion King of the jungle. Safari Spirit slot offers 5 reels, 3 rows and 30 pay lines which pay from the left to the right. Start your Savannah trip from as little as 30p up to $100 per line. There are a number of features you will enjoy on the way such as the free spins as well as stunning graphics and animations. Even though the slot has a slightly low theoretical return to player of 94.32% and a medium variance, you will benefit from the 30 pay lines and other bonus features. What's exciting is that you can play Safari Spirit slot from any device including mobile, tablet or desktop computers either in the free mode or real money. As you would expect, the theme in Safari Spirit slot is based on the beautiful African Savannah land. As the game loads, you will see magnificent sun-kissed background along with different wild animals. Ainsworth's experience in slot development is proven in this title. The slot literally takes you on a virtual African safari, as you will see the animals wandering peacefully in the wild and some trees to add on the beauty. The visual animation in the game are excellent. You will a tourist jeep moving from the right side of the screen that almost knocks a rhino. Of course, the reels are transparent to allow you to enjoy a view of the African land and all the action. Some of the characters on the screen include a giraffe, a cheetah, buffalo, lion and several standard playing card symbols marked from A through 9. Other than having an attractive theme, Safari Spirit slot is easy to play too. The objective is land matching symbols on the reels to be rewarded. As aforementioned, this slot favors players with low and high budgets. You can start staking from as low as $0.01 up to a maximum of $100 per spin. The slot is played on a standard layout of 5 reels on 3 rows which benefit from 30 fixed win lines. All the symbols pay from the leftmost reel to the rightmost except the scatter symbol. Before you embark on the African Savannah trip, it is important to adjust your bet first. All the game setting are found at the bottom of the screen. Click on the 'Gear' icon in the bottom left corner to access the main menu. Here, you can set your Bet between $0.01 and $100 as well as Lines from 1 to 30. The icon with Elephant in the bottom right corner is the Spin button that will enable you to activate the reels. You can opt to play up to 100 auto games by clicking on the bold (+) button next to the Spin icon. The symbols in Safari Spirit slot are popular animals you will find deep in the African jungles such as the lion, cheetah, buffalo, and giraffe. There are also different card values marked by Ace, King, Queen, Jack, 10 and 9. All the symbols in the game offer different payouts based on the pay table. The lion and cheetah are the highest paying symbols as they can reward up to 200 gold coins for matching 5 of a kind. The buffalo and giraffe awards 75 coins for 5 of a kind, 30 for 4 and 5 for 3 of a kind. The card symbols offers the least payouts in the game, A, K, Q, J, 10 and 9 reward 50 coins for 5 of a kind. The mighty Elephant is the wild symbol in the game. It will substitute for all other symbols except the scatter and can also appear fully stacked on reels 2, 3, 4 and 5. The scatter symbol is represented by the Landscape icon. It rewards in any position on the reels and landing 3 or more will activate the free spins feature. When the free spins feature is activated, you will receive 8, 12 or 20 free spins. The free spins are played on a new set of reels on which the wild will appear stacked. Your payout will be doubled whenever the paw symbol appears in a winning line. And if you land scatter symbols in the same spin, 5 extra spins will be rewarded. Safari Spirit on the Go! One great thing about Ainsworth Games Technology is that they know what players want. The Aussie based developer has been in the gambling market for over tow decades now. The company is licensed by the UK Gambling Commission and Alderney and their games are offered by some of the leading land based and online casinos in the UK and around the world. Ainsworth uses the modern cutting edge technology which enables their games to have stunning graphics, animations, and features. Their games are optimized for all devices including smartphones, tablets and personal computers. If you love nature themed slot, you can try out other titles from the developer like Mighty Wilds, Wild Fire Riches, Roaming Reels, Eagle Bucks and Mustang Money. 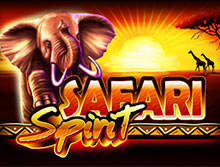 You can find Safari Spirit by Ainsworth Games Technology here at bCasino, a reputable online casino in the UK. We offer our customers a wide selection of games from some of the best software companies such as NetEnt, Playson, Play n Go, Thunderkick and Evolution Gaming. Besides, you will receive a decent match up bonus of up to $1200 welcome bonus for upon making your first deposit. Create your account today to enjoy our excellent customer support services via email or live chat.